A recruiter’s office. A pile of 500 consultant resumes on her desk. The recruiter? She’s a junior consultant. And she knows exactly what to look for—she DOES the job. Now, you have the experience. The expertise. The skills. But how can you make sure she gets the message and you get the job? A sample consulting resume that shines brighter than others. How to describe your experience and achievements to land any job you want. How to highlight the most desired consultant skills. What to add in the education section of your resume. Tips on writing the perfect cover letter. Sample Consultant Resume - See more templates and create your resume here. The bad news: the recruiter will spend only 6 seconds to scan your resume. The good news: if you format your resume right, your consultant resume will get read. Just think of successful presentation decks. What do they have in common with resumes for consulting jobs? They’re clear, to the point, and focused on clients’ needs. And what they need is clearly put in the job ad: experience, education and skills. So showcase them in an eye-friendly and concise manner. First, use the reverse-chronological resume format—it’s great for management consultants with boatloads of experience and entry-level consultants alike. Neat fonts. A clear outline. Whitespace to keep the hiring manager on track. A one-page resume works fine for consultants. But if you have lots of experience, especially with big brands, go for a two-page resume. Provide the recruiter with EVIDENCE. Evidence that you’ll perform well in your new job. Evidence you’ll have no problem switching between projects and industries. And that you simply love a good ol’ challenge. All that is just music to the recruiter’s ears. Pro tip: Not all ATS scanning software can parse PDF files. Check the job offer to make sure the employer accepts this format. Alternatively, you can use the functional or combination resume format. Check our guide to pick the best resume format for you: 3 Resume Formats: How To Choose The Best One [Examples]. Consultant Resume Objective or Summary? Writing a business or management consultant resume? If you’re applying to the Big Four, there is a 4% chance of getting accepted. What can you do to, well, become a one-percenter? Write a short and concise introductory paragraph to grab her attention and show that you’re a star performer. You can either compose a resume summary or resume objective. What’s the difference? If you have relevant consulting experience, go for a resume summary. It provides a short overview of your consultant work history and underlines your skills and competencies. If you’re a recent grad or at a point of changing career paths, pick a resume objective. It shows the role you see yourself in and your career goals for the future. Senior consultant with 8 years of experience in IT process improvement measures. Developed and executed global customer service strategies and reduced the number of incident tickets by 15%. Successfully coached and trained junior IT consultants. Entrepreneurial attitude towards challenges. Excellent communication and presentation skills. Proficient in Spanish and Portuguese. Experienced IT consultant of global customer service providing 24/7 IT support. My duties involved resolving tickets, gathering data, and conducting analysis. I have good leadership skills and can work well under pressure. The wrong senior consultant resume? Let’s just say that the first one is up the second is out. Pro Tip: Keep it short. About 50 words or 4 sentences is enough to catch the recruiter’s eye. How to Describe Your Consultant Experience? Consulting jobs come in all shapes and sizes. Regardless of whether you’re an advisor, coach, facilitator, or mentor, the experience section of your resume is key. Because it shows you can get the job done. Show off your consultant experience in resume bullets. Use resume action words to tell a story. Tailor your resume to the audience. Build credibility through achievements and data. List your previous positions using bullet points. Start with the most recent one. If you have vast work experience, for the earliest jobs you should list only the employer and job title. Describe your duties the way they align most to the job requirements. Remember to bold the employers’ names—in consulting big brands get the most “oohs” and “aahs”. Be precise: point out how much money you saved or what processes you streamlined. The first example gives a generic description of duties. The second shows that the consultant made an impact, was result-oriented, and knows her way around. And it paints a vivid picture. So you’re probably thinking that as a recent grad with no experience, you should forget about this section. Perhaps you volunteered. Or conducted paid research. All of that can make up a valuable experience section. Pro tip: Having no understanding of business is like driving a car with 3 wheels. Start a side business. Not only will it make up for your experience section but will also give you firsthand experience in business strategy. You might think that experience and skills are more important than the education you received. Consulting has its own rules. Top consulting companies want to hire only superstars. High-achievers. Top-performers. Those with in-depth know-how. So if you went to a target uni (Harvard, Stanford, Cambridge, etc. ), the education section on your consulting resume will shine like a diamond. Make sure to list your GPA, too. Pro Tip: If you have an MBA or PhD degree, toot your own horn—put that after your name at the top of the resume. The education section is more important in an entry-level consulting resume. This is the right place to mention if you were the leader of a student organization or led a campus project. What are good resume skills? First of all, “I know Excel” won’t do here. You’re racing against Excel pros. Second of all, what skills to put in your resume depends on the field you’re in. Whether you are writing a resume for an IT consultant or leasing consultant position, you’ll want to highlight a different skill set. Again, look at the job offer and think of work-related skills. Soft skills, on the other hand, are interpersonal abilities which revolve around communication skills and teamwork. Pro Tip: In consulting, speaking foreign languages is a matter of life and death. Always include your level of proficiency. You are almost done with writing your consulting resume. What about that paper you published during your sophomore year? Brag about it if you’re new to the consulting world! You can add it in an additional section as the final icing on the cake. Additional sections are a good way to compensate for lower GPA or lack of experience. What can you include there? Pro tip: Be specific. Everyone loves books and travelling. Mention something that will make the recruiter remember you and what relates to the job. A cover letter? Look at my resume—I don’t need one! The truth is 53% of employers think a resume is not enough. So make your cover letter as good as your last presentation deck for Sundar Pichai. What if it is a quick win? A cover letter is beneficial especially if you have employment gaps or are at the point of changing careers. Firstly, make it personal by starting with the recruiter's name. You don’t know it? Ask the company’s HR department. A To Whom It May Concern doesn’t get jobs. Secondly, be relevant. Tailor your cover letter to the job offer. Don’t copy-paste what you already have in your resume for consulting gigs. Summarize the data as if you were creating a pivot table. Thirdly, close your cover letter with a call to action. Underline that you will be waiting for the recruiter’s response. A simple “I’m looking forward to hearing from you” is as generic as Walmart's cheapest hair conditioner. Pro tip: Show your enthusiasm about the prospect of working for the company. Do some research and reference some of the firm’s recent accomplishment or projects in your cover letter. 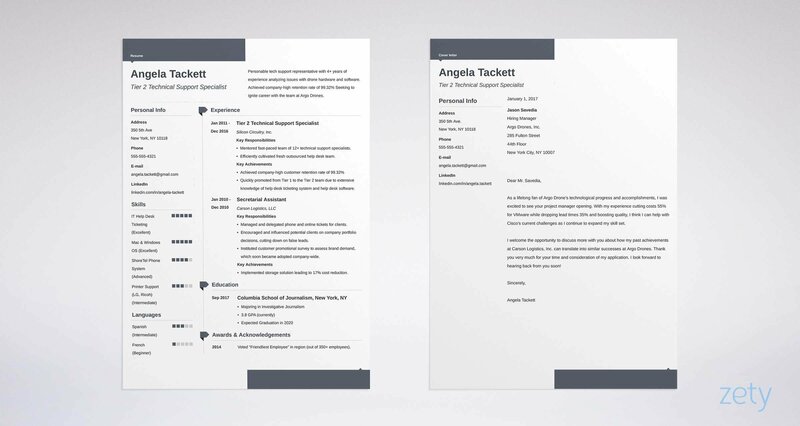 Use an easy-to-follow layout for your resume. Mirror the wording in your target job descriptions. Catch the recruiter’s attention with a heading statement. Quantify your results and experience. Avoid typos and formatting bugs by proofreading the resume a couple of times. Write a personalized consultant cover letter. Regardless of whether you’re a business consultant, sales consultant, marketing consultant or any other consultant, check out the best resume examples for any industry. Do you have any questions on how to create a consultant resume? Let us know in the comments section! Dominika is a job expert with a focus on career development and onbarding processes. At Zety, she writes guides helping readers create winning resumes and manage the various difficulties of the job hunt.